A California-based company is slated to bring its rail energy storage system to areas of Southern Nevada. 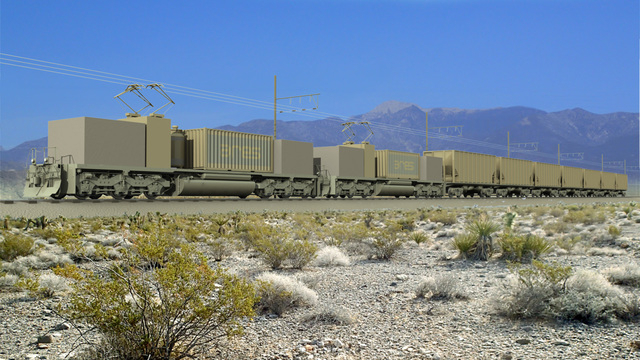 Advanced Rail Energy Storage, LLC been granted a right-of-way lease by the Bureau of Land Management for their proposed commercial-scale gravity-based rail energy storage project called ARES Nevada. When up and running, the 50-megawatt project will cover 106 acres of public land near Pahrump, including portions of Clark and Nye counties within the Carpenter Canyon area. The addition of the project will help stabilize the electric grid in the area. ARES Nevada will connect to the power western grid through the facilities of Valley Electric Association. “Creative solutions like ARES Nevada provide a more reliable and modern electric grid and help create an even cleaner energy future for our citizens,” said Angie Dykema, director of the Nevada Governor’s Office of Energy. ARES Nevada will store energy via gravity and release it for dispatch when needed. Using a solitary railroad track placed on a gentle grade, multiple electric locomotive cars can move up the track as they receive excess power from solar and wind power plants during sunny and windy days. The train cars will be active and will be dispatched slowly downhill, using their motor-generators to return power to the electricity grid as needed. ARES Nevada will provide a vast range of additional services, allowing the grid to alter for brief changes in demand and help stabilize grid voltage and frequency. As soon as the permitting and environmental compliance processes are complete, the project is planned to get underway. The energy solutions are not the only thing the ARES Nevada project will provide, as around 100 to 125 full-time local jobs during an eight-month construction phase will be created, in addition to an anticipated 16 full-time positions once the project is operational. The project’s life span is anticipated to be 40 years or more with only routine maintenance. For more information about ARES, visit www.aresnorthamerica.com.